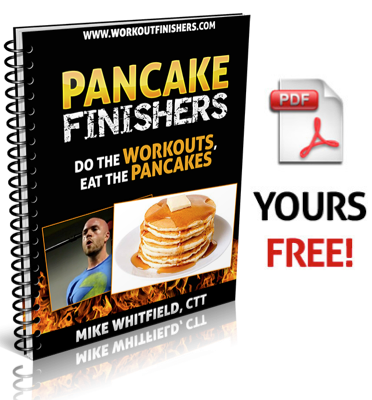 Enter your best email to get instant access to the NEW Pancake Finishers Workouts Worthy of a Stack of Pancakes. You'll also get exclusive access to expert tips on the latest workout finishers and random hilarity (it's a word). Your email is 100% safe and secure and will NEVER be shared or sold to ANYONE. I hate spam as much as you do. You don’t need any marketing hype bullets dude. You get pancakes after each of the workouts man. C’mon. Pancakes. Paaaaaancakes. You get bacon after Workout C dude. Yeah. Bacon AND Pancakes. Paaaaancakes.